White water rafting is a great way to experience thrills, enjoy spectacular scenery and bond with friends or colleges. But this unique excursion also requires you to bring with you certain garments and gear — especially if it’s a multi-day rafting trip. This guide will show you how to prepare for a multi-day rafting trip, the types of accommodations available and the other arrangements you need to make for this wet and exhilarating adventure. We’ll cover what to bring, what to leave behind, and a whole lot more. Sunscreen and lip balm:Although many of us associate sunscreen with the hot, summer months, this protective cream should be worn on spring and fall trips as well. Store it in a sealable plastic bag to keep it from making a mess inside your luggage, and remember to bring along some lip balm with SPF. Moisturizing cream:On a rafting excursion, your hands will repeatedly get wet and dry off — and this cycle can wreak havoc on your skin. Protect your hands while paddling with a lotion or moisturizing cream. Ideally, try to find an all-natural salve that can both moisturize your skin and heal minor cuts. Sarong: One of rafting’s must-haves, sarongs are a particularly flexible accessory for both men and women — you can use it to dry off after a swim, protect your skin from the sun or put it over your seat so your legs don’t get dirty. You can also use it as a pillow, bandage or headdress. The options are limited only by your imagination. Day dry bag: It’s called a dry bag, but it won’t keep things dry unless you know how to close it correctly. Ask your guide to make sure your technique of rolling and buckling is right. You should be able to carry your day dry bag easily in one arm. Any fragile items should be stored in your day bag to minimize the chance of them being damaged when the boat is being loaded and unloaded. Extra layers: In a river canyon, you never quite know what weather conditions you’re going to encounter, so it’s best to be well-prepared. Bring along a few layers for the rain as well as some long underwear or a light fleece top in case you encounter some chilly or wet weather. Toiletries: Make sure your essential toiletries, from medications to contact lenses, are close by and easy to access. Camera: Traveling down the Chattooga and Ocoee Rivers, you’re going to pass some pretty beautiful landscapes and create some fun memories, so don’t forget to bring along a camera — ideally one that’s waterproof. If not waterproof, keep it in a waterproof case or a bag you can trust. One or two big water bottles: Although you may not consider yourself much of a water drinker, this habit will need to change once you arrive. You will be exerting yourself by paddling, unloading boats and hiking, so it’ll easy to get dehydrated if you don’t get enough water. For this reason, bring at least one large water bottle, or ideally two — and make sure to drink them. Broken-in shoes: Uncomfortable shoes can ruin an otherwise pleasant whitewater rafting trip. Even if you’ve done your research and bought the perfect pair of rafting shoes for everyone in your family, if you don’t break them in before the vacation, you might all have blisters from the first hike. After buying your shoes, walk around in them for a few days to break them in. Bug spray: Don’t let pests detract from the beautiful sights and sounds around you. Ponytail holders: You don’t want your locks obstructing your view as you speed down some rapids. Get a ponytail holder to keep the hair out of your face. Sleeping bag:While our guides provide the tents and other overnight rafting trip gear, you will be responsible for your sleeping bag. Hoody:If the weather’s cold, a hoody is a highly recommended. Whether it’s made of cotton, fleece, wool, down or some synthetic material, bring it along on your rafting trip. If it’s lightweight, water-resistant and compactable, that’s even better. Quick-dry undies:Let’s be honest — what you wear down below can seriously affect how good you feel overall, especially if it’s cold. To maximize your comfort while rafting, find some underwear that are compact, moisture-wicking, odor-resistant, comfortable and lightweight. Beanie: If you’re rafting during the colder months, bring along a knitted cap. It’ll come in handy if your ears get cold around the campfire — or you want to hide some embarrassing bed head after waking up. Beanies are great for helping you retain heat, and also cover up the fact that you’ve gone four days without washing your hair. Long underwear:You will not regret bringing along this warm undergarment. On the boat, you can wear it as an extra insulating layer, and it should be able to dry out fast enough to warm you up at the camp. Paddling pants and jackets: These handy garments help to keep the spray off your legs. At our outpost, we provide these items free of charge. Wetsuits: These suits, which provide thermal insulation and protection against abrasion, are highly recommended for white water rafting. This is something else we provide at our outpost. Cotton snap-down shirt:This shirt is light, fashionable and easy to throw on and take off. It’s perfect river attire for moderately warm weather. Jeans and/or a cotton dress: Wearing jeans isn’t advisable while on the raft, but once you’ve arrived at camp, you might enjoy slipping into a dry pair of jeans or a light travel dress, especially if the weather’s not too cold. After wearing damp, synthetic layers all day, these items are a welcome change. Body wipes: When you go several days without a shower, you — and all your other travel companions — will appreciate the body wipes. UPF-rated sun shirt:For hotter weather, make sure to bring along a shirt that won’t just protect you from UV rays, but will also keep you cool. Find a brand that has a built-in cooling mechanism that is activated by sweat. Flip-flops: Although not recommended while rafting, flip-flops are a good footwear option for when you reach your camp and want to let your feet dry out — if it’s not too cold, that is. Try to find a pair with several strap options and rugged, grippy soles. Wide-brimmed sun hat: When you’re outside in the sun all hours of the day, portable shade is always a good idea. Protect your skin from harmful rays while staying stylish at the same time. Plastic poncho: This may work for an amusement park, but it won’t keep you dry on a long whitewater rafting trip when it rains for several days straight. A cheap plastic poncho is also a pain to hike in, doesn’t keep out the wind and will likely get caught on trees and bushes. Instead, invest in a quality rain jacket. Naked sunglasses: If you wear regular sunglasses on your rafting trip, that first splash of water in your face will send them right to the bottom of the river. We recommend a brand such as Croakies or Chums that won’t fall off when you’re plunging through the rapids. Cotton socks: Cotton is not going to keep you warm and dry when it’s wet and windy. If you want your feet to be comfortable, opt for synthetic or wool instead. Makeup: If you usually wear makeup, leave it at home. Even if you have a pimple, no one will judge. Glass bottles: Try your best not to bring any glass bottles on the trip with you, as they could endanger our rigs. If you’re bringing liquor or wine, transfer it to a steel or plastic bottle. We want to avoid broken glass in our rafts and on our beaches. If you’re coming from farther away, you will probably want to spend the night near the river before and after your rafting excursion. 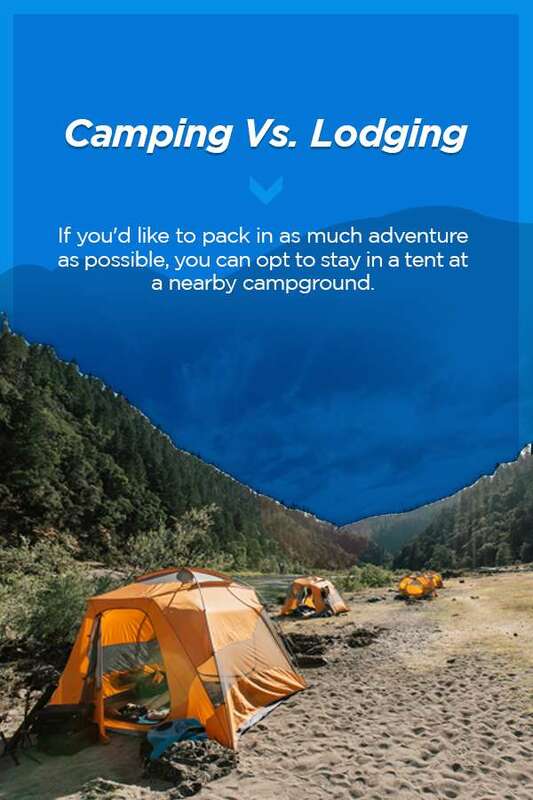 If you’d like to pack in as much adventure as possible, you can opt to stay in a tent at a nearby campground. If you’re looking for something more comfortable, on the other hand, you can stay in a number of hotels in the vicinity. Big Lodge at Raft1: If planning an excursion to the Ocoee River, the Big Lodge at Raft1 is a large, comfortable accommodation that can hold up to 44 people in individual beds. It also has two floors, so you can easily separate your group by gender. The house also has air conditioning units, which many consider a necessity on the hot, humid summer nights in the South. Groups can also cook in the lodge, as it is equipped with a kitchen. The lodge has two bathrooms, and showers are just a short walk down the hill. This is one of the better options for older or less adventurous visitors. Small Lodge: The Small Lodge features two bunkbed-style rooms and can house 16 people in individual beds. While this lodge does provide mattresses, visitors will need to bring their own pillows, sleeping bags and towels. This lodge also has air conditioning, two small bathrooms and a small kitchenette equipped with a fridge, sink and microwave but no stove. This more rustic option is great for those who want to rough it a little but not go all the way. Raft1 Outpost: If you and your group members truly want to rough it, we also have two campsites, each of which holds three to four small tents. You’ll need to bring firewood, water containers, garbage bags, flashlights, matches, towels, sleeping bags, a ground cloth or tarp, tents and folding chairs. If your group requires more room, the Thunder Rock Campground is just a five-minute drive away. If you’re planning to go rafting at the Chattooga area, there are also a variety of lodging options available in South Carolina, Georgia and North Carolina. Hotels: In South Carolina and Georgia, it is easy to find good hotels within driving distance of the river, with those in Clayton and Dillard being the closest to us. In these towns, there are close to a dozen options, including inviting bed-and-breakfasts and inns. If you would like to stay in North Carolina, Franklin and Highlands also boost many great options. Check out some of our accommodation recommendations near us. Campgrounds: If you’d like to set up camp before you hit the rapids, this is also an option. Many of our guests bring their own equipment and make a weekend out of it before setting out on the river. The Chattooga River is a popular destination for rafting, so book well in advance to ensure you’ll have a place to stay that’s not too far away. Also consider booking during the off-season, as you are more likely to find convenient accommodations at that time. A delicious, high-calorie treat: You remember that delicious chocolate bar that you could never justify eating? Bring it along on your trip, because you’ll definitely need the calories. Your favorite alcohol: How about that pricey vodka you can never bring yourself to buy? This adventure is the perfect occasion to indulge. Or bring along your favorite microbrew from back home to represent where you’re from. A headlamp: This one comes in handy if you want to read at night. Try to get one with a red light option so the bugs will stay away. So you’ve found a group ready for a rafting adventure. What are the next steps? Make lists: Make a river rafting packing list and an overnight rafting trip checklist. Make sure everyone else in your group does the same. Review travel and logistics expectations: Plan how you’re going to transport your entire group. Book tickets: Last but not least, don’t forget to reserve your tickets, and let everyone else in the group know when tickets must be booked. You can book now for the 2019 season on the Chattooga and Ocoee River. 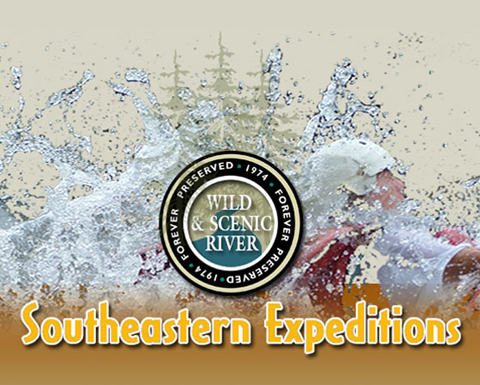 At Southeastern Expeditions, we’re committed to providing you with a safe and exhilarating experience where you and your fellow group members can bond and make lasting memories. As everyone has different endurance levels and excitement thresholds, we offer trips of varying lengths and degrees of difficulty. Upper Ocoee: A site from the 1996 Olympics, this stretch of river known for its big water and large drop pool rafting. With the guidance of your experienced guide, you will venture through a half mile of Class IV and V rapids. As most of this five-mile trip meanders through secluded wilderness, you’ll enjoy the beauty of untouched nature. Middle Ocoee: If you crave excitement, the Middle Ocoee is for you. Featuring rapids from Class I to IV, this stretch of the river a fast-paced descent down rapids like Grumpy’s Ledges, Broken Nose and Tables Saw. Full Ocoee: If you’re up for a full day of rafting fun, we’ve combined the Upper Ocoee and Middle Ocoee River trips into one back-to-back excursion. After completing the Upper Ocoee section, we’ll take a break, dry out a bit and eat a delicious lunch. Then we will continue on to the exciting Middle Ocoee section. Beginner Fun: If this is your first time — or you would just prefer a more relaxed experience where you can take in the amazing scenery — consider booking our Wild Section III. This fun, six-hour excursion is also great for families or people who want to guide their own raft. High Adventure: If you’re craving some excitement, consider our Wilder Section IV. You can crash through rapids rated class IV and higher and stop to view some breathtaking waterfalls along the way. This seven-hour trip is fully guided, so you don’t need any experience. Overnighter: This multi-day rafting trip combines camping and rafting on the Chattooga River. The first day of the excursion features Section III of the Chattooga River, and that night you will set up camp in the Sumter National Forest, where you’ll be treated to a delicious meal of steak or locally fished trout by our expert camp chefs. The next morning, you’ll awake to the mouth-watering smells of a country breakfast that will give the fuel to tackle the intense rapids of Section IV. We believe this trip offers the best value of any multi-day rafting trip in Georgia or South Carolina. If you have any questions about the packages we offer, call us at 1-800-868-7238.